I was dreaming in German last night… for the second night in a row. The problem with that is, well, I really don’t understand German. I actually studied the language in school…two years in junior high, two years in high school and a painful semester freshman year of college. I suppose it says more about how Americans are taught languages and less about my intelligence…regardless, it’s silly for me to say “ich verstehe nicht”… but who was I actually going to converse with in German? One of the reasons I chose to study German, instead of French or Spanish, was actually my family heritage…I’m not sure exactly why, but it had something to do with honoring my ancestry. I suppose that was as good a reason as any. I remember consulting my parents and they thought it was a good idea at the time. And now I find I really do want to learn (or relearn) the language. I’ve gone so far as to “google” available classes in my city. I’ve scoped out the Germany Society website to see what they offer. And…that’s as far as I’ve gotten. And now this… I’m starting to dream in a language I don’t understand. It’s those voices in my head again. Only now we have a language barrier. Go figure. Es ist gemütlich… I woke up sometime last night with that thought in my head. In the haze of sleep I remember thinking…you need to look up that word in the morning. Germütlich. It’s actually not unusual for me to wake up in the middle of the night to remind myself to follow through with whatever it is I happen to be dreaming of. Sometimes I think my waking hours are in service to the people, places, and events that populate my sleeping time. So, this morning I dug out my German translation dictionary and found that es ist gemütlich might mean something like… it is comfortable, cozy or pleasant. If I had heard “sie ist gemütlich” it would mean something more like she is friendly, cheerful or easy going. Wikitionary tells me that gemütlich derives from Gemütlichkeit… “a word that describes an environment or state of mind that conduces a cheerful mood and peace of mind, with connotation of a notion of belonging and social acceptance, of being cozy and unhurried.” Okay…so it appears I was having a peaceful sort of experience in the middle of the night. These German ancestors basically break down into two sorts…those who arrived in the British colonies prior to the American Revolution and those who arrived in the early decades of the 19th century. I’m told that the earliest German immigrants were searching for religious freedom. It should have come as no surprise then that these ancestors were attracted to William Penn’s promise of religious tolerance. Yet I am still taken aback each time I discover a 5x or 6x German grandparent living in Pennsylvania (my current home state) prior to the American Revolution. Along with the Zartman family I’ve previously mentioned, there were families named Fisher & Fischer, Schieff (Scheaff), Lefler (Lofler), Pflueger, Trinkel, Denger, Wambold, Hauser, Ehro, and Reitenauer (Ridenour). Some claim the Reitenauers to be French, but they were likely from the Baden-Württemberg area that had permeable borders with France. These particular ancestors did not appear to be attracted to city life in Philadelphia. While several lived out their lives in the Germantown section outside of downtown area, most moved westward settling in the counties of Berks and Lancaster and further out to the counties surrounding the Susquehanna River. The first Federal Census conducted in 1790 showed that a full third of Pennsylvania’s residents were German. Many of those Germans continued to spread westward. A good number of my own ancestors ended up in Ohio and were among the earliest settlers of that state. 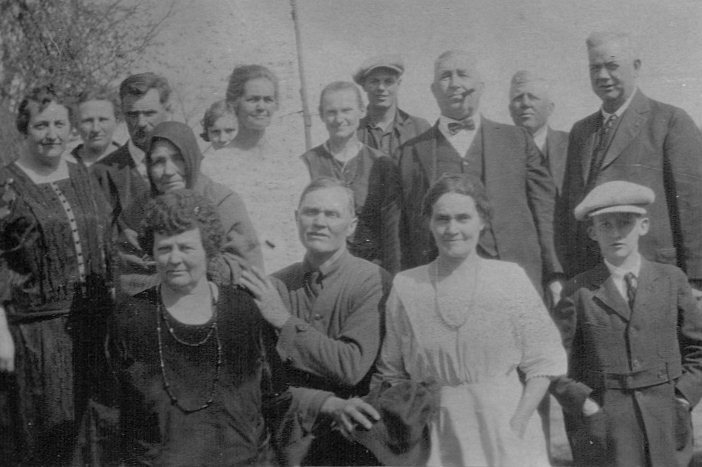 The second wave of my German ancestors arrived in America between the approximate years of 1833 and 1855. Many Germans immigrated at this time—having received word from those friends and family already established here—that they could acquire cheap land with relative ease. This was a time of large scale immigration, with early immigration averaging at about 10,000 Germans a year to the peak in 1854 of approximately 220,000 German immigrants. Those who arrived in later years (around 1860) were offered US citizenship if they volunteered to fight in the American Civil War. One thing I find fascinating is how the Germans stayed so “German”… they continually married other Germans and mostly lived in German communities. On my paternal side, I can’t find anything but Germans…my great grandmother was born in Canada, but that’s only because her German family (named Weidenhammer) immigrated there before they headed to the United States. 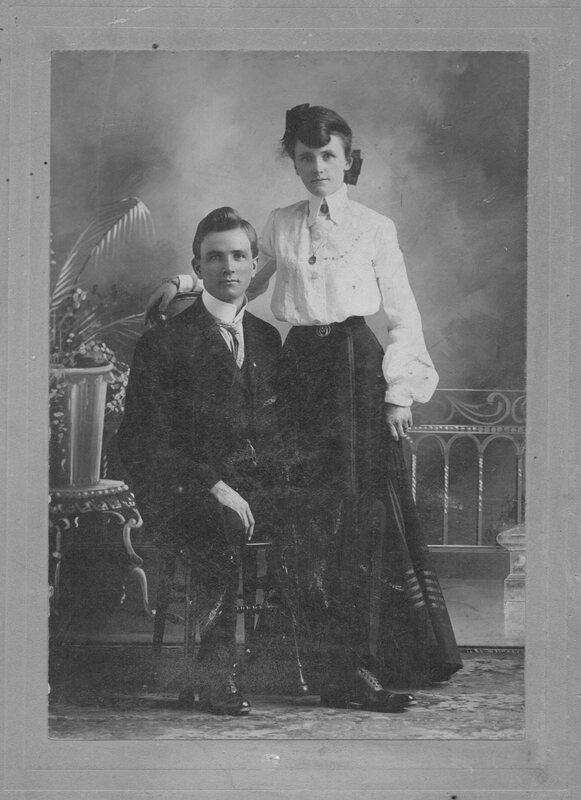 It took until 1935 for the first “break” in the family to occur—when my grandmother Evelyn Marie Kaasch eloped with my grandfather Clifford McGuffin, she was the first person to marry a non-German. No wonder my great-grandmother Julia Bott Kaasch was so upset. 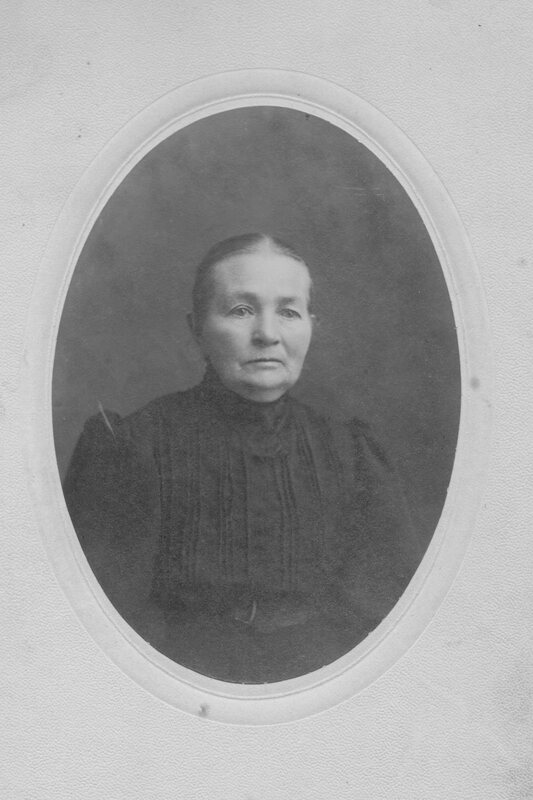 As active readers of this blog already know, Julia descended from the Zartman family, who were part of the pre-Revolution group of German immigrants. The first wave Germans in my family continued to marry other first wavers up until my great-great grandmother Martha Zartman. She married Gottlieb Bott, whose family had only arrived in around 1845…a relative late-comer. Martha’s daughter Julia married Archie Kaasch, whose grandfather arrived on the scene in 1853. Even though they married second-wavers, they still managed to marry men who came from the same regions (or states) of Germany from which their ancestors had emigrated. I don’t think this is coincidence. 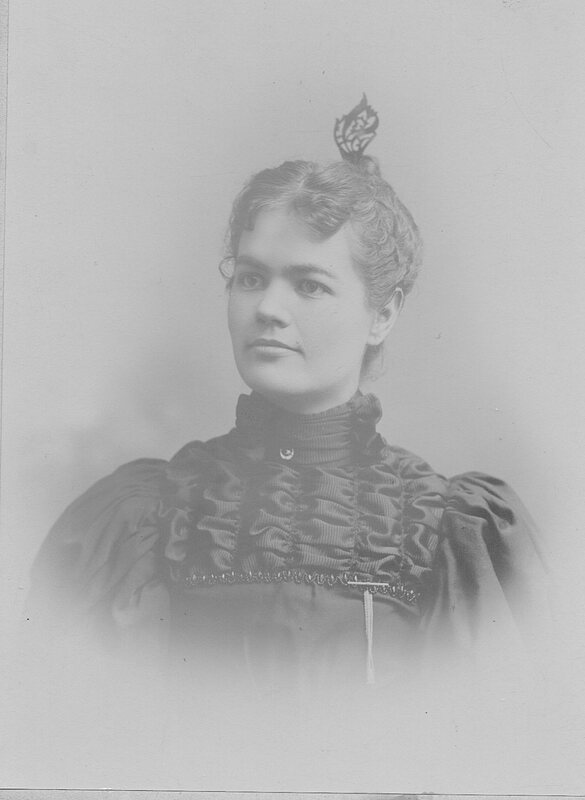 Julie Bott Kaasch, the seventh generation born in America, even attended German school as a child (in the 1890’s). I stated that my German ancestors arrived in two waves…I should say that 98% of them arrived in the first two waves… my paternal grandmother’s father and grandparents (the Schank Family) did not arrive until about 1883. They were part of a wider immigration movement in the 1880’s that was driven by the increased availability of steamships and ocean liners. This last wave of European migration would be the impetus for the creation of Ellis Island which opened its doors in 1892. When my parents visited Ellis Island many years ago, they came away broken-hearted that they could find no information about any of their ancestors. 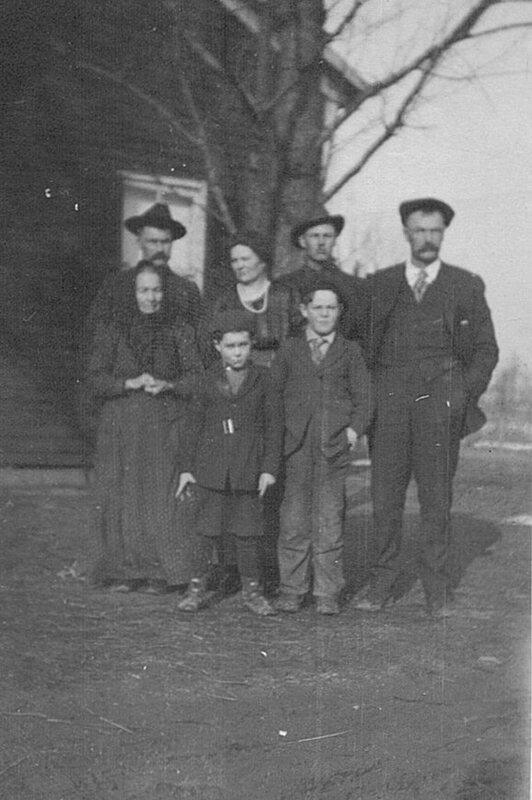 What they didn’t realize at the time is that all of their relatives had arrived well before Ellis Island had even been created. When my father married my mother, he was the first on my direct paternal side to marry a woman who wasn’t 100% German. My mother’s maternal German roots run deep, but the paternal (McGuffin) half of her carries Scotch, Irish, English, Dutch, and French blood (and it appears not a drop of German). While I’ve grown up self-identifying as being of German descendent, it’s been my mother’s paternal McGuffin roots that have held the majority of my interest these past few months…as they were previously unknown to me AND fascinating to boot. Today I’ve decided it’s time for me to delve a bit deeper into the Otte family. This is my maiden name…the name I carried for 27 years. 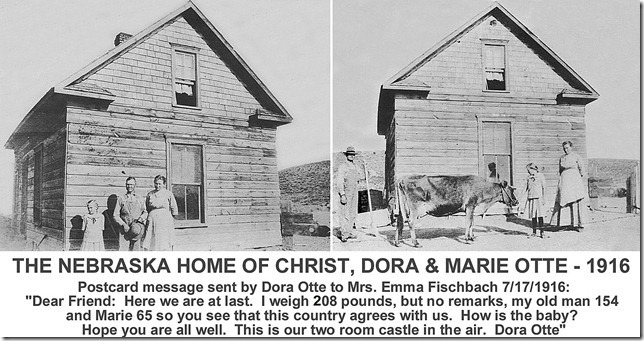 I thought I knew the story of the Otte family. As it turns out there was a bit more to discover. My mother recently came across a large envelope that she hadn’t realized existed. We think perhaps it was given to my father by his father Fred Otte. Back in the ‘80’s my father had an interest in tracing his roots and grandpa Fred had given him some information he’d obtained from one of his Ohio cousins. My father probably put this envelope of information and photos in a drawer for that magical time he planned to look into it all. With my grandfather and father no longer here I was overjoyed to be handed this envelope. My grandfather was a good storyteller and lucky for me, he left some good notes and photos with detailed descriptions. 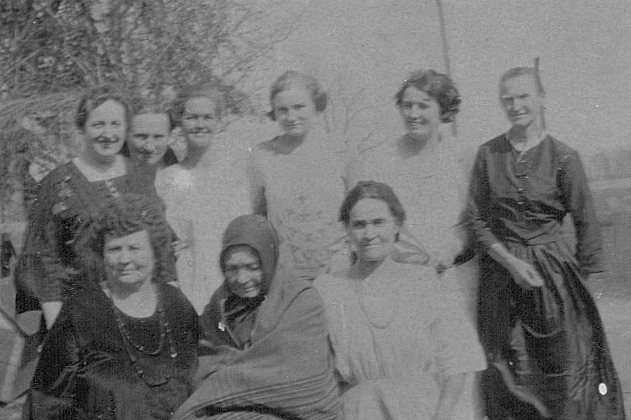 The Ottes were part of that second wave of German immigrants…the ones that came to America looking for land. Growing up on the extreme West and then East coasts, my maiden name was quite rare and NO-body could figure out how to pronounce it… Oat, Ohtay, Ahht, Audi…for the record it’s “Ahh-dee” although some might pronounce a bit more of a “t” than a “d”… We used to joke in my immediate family that if you came across another Otte you’d surely be related…because we thought there were about twenty in America. Turns out we had it all wrong. I’m told if you live in a place like Ohio and Indiana there are thousands of them…and people actually know how to pronounce the name when they see it. Imagine that! It appears there were many people with the name Otte that arrived from Germany at this time in search of land. They all had the same idea and Ohio seemed to be a good place to go when you were looking for your plot of paradise in the 1830’s. My particular branch arrived in Baltimore Maryland in 1834. My 3x great-grandfather Friedrich Wilhelm Otte (aka William) arrived at the age of 23. It appears he met his wife in Baltimore, Anna Marie Elizabeth Buddemeier, as records show they married and settled in Baltimore in 1836. I believe they both came from the Nordrhein-Westfalen area of Germany. I have yet to determine when Anna arrived and whether she came with her parents or other siblings. But by 1837 the couple left Maryland and relocated to Ohio. It wasn’t until 1854 that they purchased their own 80 acre farm 3 miles west of New Bremen Ohio. 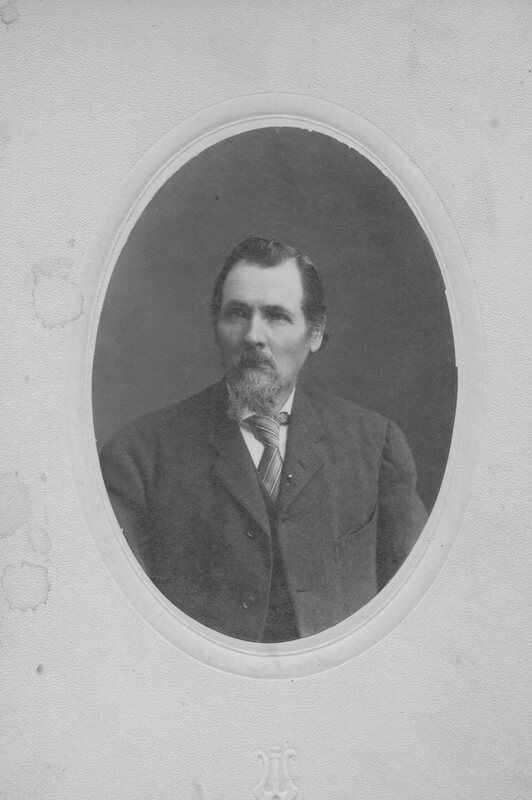 Anna gave birth to 7 or 8 children…my 2x-great grandfather, Johann Wilhelm (William) Otte, was their third child and first son. He was born in Mercer County Ohio in 1843. In 1863 this (second) William would marry Anna Marie Elizabeth (Elisa) Sollman. Like William, Elisa’s parents also arrived in Baltimore (in 1833), but her family came from Osnabruck Germany. Elisa was born in Indiana, but eventually her family too settled in the New Bremen area of Ohio. The 1880 Federal Census shows William and Elisa living and farming alongside William (Sr.) and Anna. I was told that in 1900 they purchased their own 10.5 acre farm. Elisa gave birth to 9 children during this time period, the last child, a boy died at birth. Elisa & William also raised a boy Fred who came to live with them after his parents had died, and later when they were in their seventies, they took in a little girl named Dora whose mother was a relative of Elisa’s. William and Elisa’s children were: Mary (b.1863), Katie (b. 1865), Will (b. 1868), Christ (b. 1870), Lizzie (b. 1872), Henry (b. 1874), Fred (b. 1876), and Carrie (b. 1877). 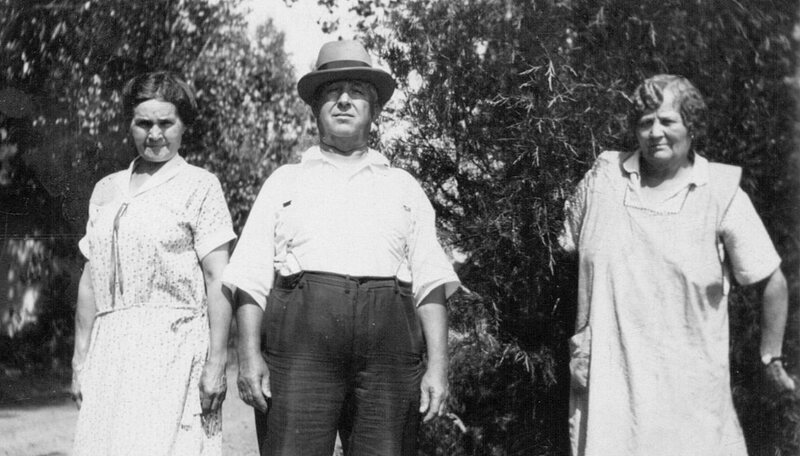 Henry was my great-grandfather and the man previously chronicled in “Homesteaders, Hometowns & Final Resting Places” (see 2-17-12 post). I remember my grandpa Fred mentioning his various aunts and uncles through the years…and his Ohio cousins, but it wasn’t until this week that I really gave them much thought… until I took time and dissected the information and photographs contained in that envelope my mother delivered. 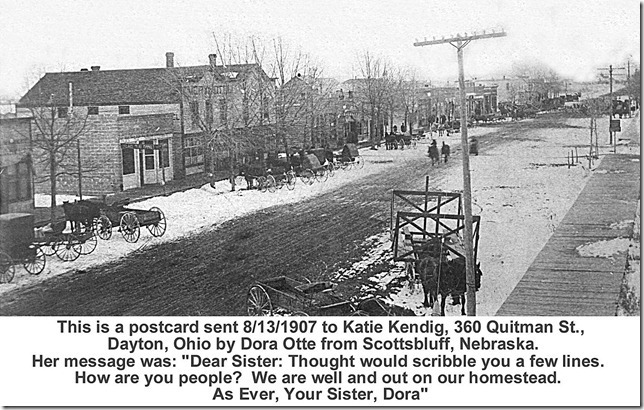 The first photo that captured my imagination… captured my heart really…was one of sister Katie (age 62 and widow of Walter Kendig), sister Mary (age 64) and her husband John Doench (age 60, a bricklayer from Dayton Ohio). According to my grandpa Fred the picture was taken in 1926/27, when the siblings were visiting their brother Will who had cancer. Will was a farmer who also had a ranch about 30 miles northeast of Scottsbluff, Nebraska. They took John up to the ranch as he’d never been out of Ohio prior to this trip…out there in the middle of nowhere John said he thought he had come to the end of the world…and if it wasn’t, you could certainly see it from there. The second photo features their niece Wilma at about age 10. Even at that age she looks like she can take care of herself…but I think about her knowing her father would die a short time after the photo was taken. She would go on to have a ranch of her own, as she married a man named Irvin Petsch who’s family were ranchers in Wyoming. They purchased the Y6 cattle ranch in Meriden Wyoming which grew to over 40,000 acres. These sisters fascinate me. Mary was 34 years old when she married her husband John, Katie was 36 when she married Walter Kendig, a barber 4 years her junior. Sister Lizzie was 28 when she married Ed Kuenning. Ed appears to have been a farmer. Lizzie would have one son a year after their marriage, but would become a widow within a few short years. Neither Mary nor Katie had children. After Katie & Walter married they lived with Lizzie and her son Wilbur on what appears to be Lizzie’s farm, as the 1910 census lists her as “head” of house and a farmer. Brother-in-law Walter Kendig is listed as a barber. Katie’s husband would die by 1916, after 14 years of marriage. All of these women appear to have lived their lives on their own terms….with independence and their own homes and jobs. Katie worked for many years as a cook for the NCR company (National Cash Register) that was based in Dayton. Before Lizzie turned to farming after marriage she was listed on an earlier federal census as a dressmaker. Unfortunately it appears the same cannot be said for their youngest sister Carrie. I was curious as to why I never found Carrie included in the pictures at all these family gatherings. She too lived with her sister Lizzie for a short time, but tragically ended up in the Dayton State Hospital (for the Insane). The history of the hospital can be found online…and it appears to be one of those Victorian era locations that were once billed as “ a retreat” that we now understand could be quite torturous. I have yet to discover what led young Carrie to be institutionalized in such a place. She would spend 18 years at the hospital and die at the age of 40 of heart failure. It makes you wonder if she didn’t just die of a broken heart. The brothers also appear to live their lives in an independent fashion…with three of the four heading out to Nebraska to acquire their own land through homesteading. Will and Henry would make a life in Nebraska, while brother Christ would eventually return to Ohio after several years. Youngest brother Fred seems to stick close to home. He married, but only stayed with his wife a short time before they were divorced. The Otte brothers returned to Ohio for visits. 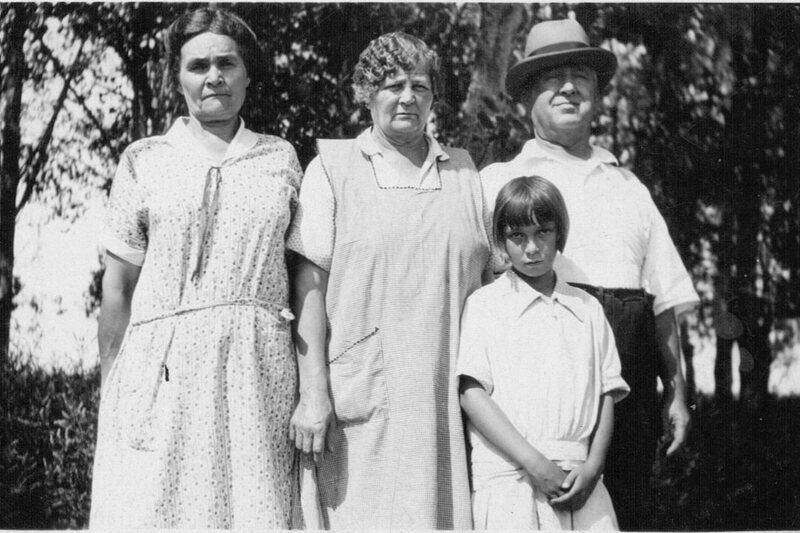 This is c. 1920 at the New Bremen home of sister Lizzie Kuenning with their mother Elisa. 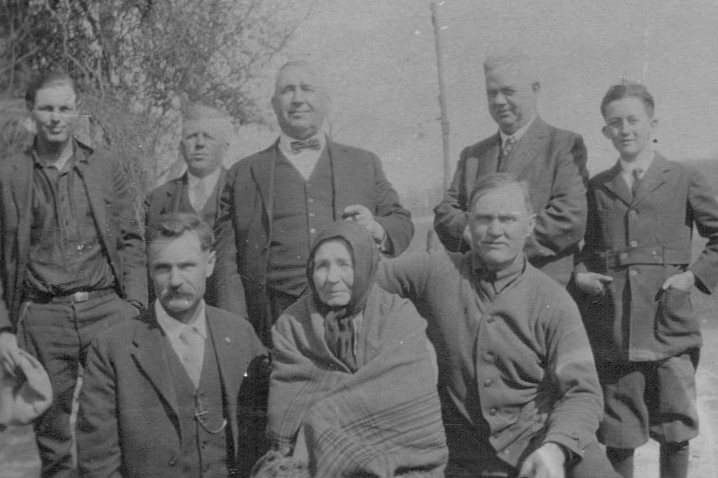 Also pictured (back row) brother Henry Otte, sister Katie Kendig, nephew Wilbur Kuenning,, and brother Will Otte. Front row with their grandma is Ray & Fred Otte (Henry’s sons). I love they way Fred (my grandpa) is mimicking his uncle Will’s stance. And this is where I am going to end my tale of the children of William & Elisa Otte for today…as there are more stories to come. What I will tell you is that inside that envelope I found a letter written to my grandfather and grandmother (Fred & Dolly). It was from the early 1980’a and was an exchange discussing some family pictures that Fred had sent to his cousin Marie’s daughter, a woman named Lucille Francis. When I saw that name a light bulb went on in my head, I had seen that name before (quite a lot in the last few days as it turns out)…Lucille Francis…attached to all this wonderful family information on a website called Find-A-Grave. She literally knows where all the bodies are buried. With a small bit of sleuthing I found Lucille’s email address and sent her a message…within hours she sent me a reply…and we’ve only just gotten started on our own exchange…two days in. I’m not quite sure what our official relationship is, her mother and my grandfather were cousins…so it makes us some sort of cousins, several times removed? Good enough. I will give you a little tidbit of what she has sent my way… and save more stories for another day. Great post. I’m looking forward to learning more about your family. Nice post. In reading, I saw the name Zartman, and thought it looked familiar. My husband’s 5th great-grandmother was Susanna Zartman, who married Conrad Schreckengost in 1784. Interesting PJ…I’ll have to see if I can figure out the connection…such a small world. Funny, I’ve begun my search on my father’s side, our surname is Fischer, waiting for a death cert. so i can find my gg grandfathers name. I’ve found Fischer in early 1750’s in York, PA, and Fisher (also sometimes spelled Fischer) in Germantown, PA 1760-1790’s…let me know if your family connects to those locations!